With Spotify Social, you can share your favorite music. Spotify Social taps into your existing social networks. If you were around in the pre-Internet days, how did you share your favorite music? Swapping mix tapes with friends? Lending them your CDs? Or maybe you just sat in your bedroom, playing it really loudly for all to hear. Welcome to the 21st century! In fact, any Spotify account created after September 22, 2011, requires you to sign up through Facebook — there’s no hiding from it, Spotify wants the social music experience to be a part of your world from the word go. After you log into Spotify, you see all your Facebook friends who are also using Spotify magically appear in your People list in the main pane (accessible by clicking the People link in the main left-hand sidebar). The People sidebar (on the right) is where you can list your best Spotify buddies so that their profiles are easily accessible. Just hover over a name in your People list and click Add to Favorites. And if you know someone’s Spotify username or have access to his Spotify profile page, you can add that user to this list, too. 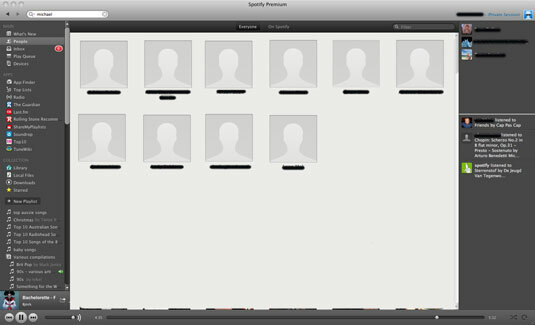 Profile picture and name: The friend’s Facebook profile picture, along with his real name, are automatically displayed, with the Spotify username listed after this information in brackets. If anyone disconnects her Spotify account from Facebook, a silhouette image appears in place of the profile picture, and the profile name defaults to the Spotify username. Published playlists: Playlists that your friends choose to make public appear on their profile pages. These playlists include ones they’ve created (such as “Songs to Do Housework To”), as well as ones they’ve subscribed to (such as Britney Spears’s “Back to the 1980s” playlist). You subscribe to a playlist by clicking Subscribe, found below the playlist name. Top tracks and artists: You can see links to your friends’ most-played tracks, along with links to their most frequently played artists, if they choose to make this information public. To keep it all fresh and interesting, this list is updated about once a week. Spotify updates your friends’ listening activity in real time. This includes tracks they’ve listened to, tracks they’ve added to their playlists, and playlists they’ve made public. Find this information at the bottom of the People sidebar. Click an item to view more information. You can also use Facebook’s Music dashboard.